Ganoderma extract primarily works on your immune system. It comes from a red-colored mushroom that goes by the name of Reishi and Lingzhi. It's Reishi if it's from Japan and it's Lingzhi to the Chinese. It can't be eaten fresh, raw or cooked unlike the edible species of mushrooms. It's not poisonous but its extract has a bitter taste. It is used solely for its medicinal benefits which I believe is more than good enough. Many species of medicinal mushrooms are used in traditional medicine in Asia but the red Reishi mushroom is particularly superior. It's because its extract contains polysaccharides such as lentinan. You'll learn more about this below. Numerous medical journals published in the US National Library of Medicine have already proven that Reishi mushroom has a preventive effect on cancer development and even its spread among patients. But mainstream medicine in the West has started looking seriously on what Ganoderma extract can offer only during the last 20 years. Health institutions such as the Cancer Research UK (CRC), the City of Hope National Medical Center in California and the Memorial Sloan-Kettering Cancer Center are now pursuing researches and studies on red Ganoderma or Reishi mushrooms. However, many mainstream medical doctors in the West are still skeptical and frown on its healing properties and potentials to build up the immune system for prevention against cancer. It is my hope that someday they will be open and accept the healing potentials Ganoderma extract can provide. I found a medical paper entitled Medicinal Mushrooms: Their Therapeutic Properties and Current Medical Usage with Special Emphasis on Cancer Treatments which I will use as my reference. It was written by Dr. Richard Sullivan, John Smith and Neil Rowan. Many terms used are too medical in my opinion which are quite difficult to follow. But it is an extremely interesting and eye-opening paper. The authors distinguished the different mushroom types. In page 15 of the paper, there is a list of edible, poisonous, psychoactive and medicinal mushrooms. The paper's major focus is on the medicinal mushrooms to which Ganoderma belongs. I will be citing 2 key points from it on how Ganoderma works and benefits your body. Now, what does an immunomodulator do? It either stimulates or suppresses your immune system. Is this good for you? You can bet it is. If your immune system is weak, Reishi mushroom extract can enhance its responses. You need a strong immune system that can work efficiently against viruses and bacteria. If your immune system is too active (which is what happens in an autoimmune disorder), extract from Reishi mushroom can regulate and normalize its activities. I'm a living proof of how effective it is. I have been taking Ganoderma extract supplements since 2004. I just came from my OB-Gyne for my routine check up. I underwent an ultrasound examination. She had good news for me: my ovaries and uterus don't have any polyp or myoma growth. Often, you eat a lot of unhealthy food that makes your body acidic. Taking Ganoderma extract supplements can create a balanced environment inside your body. A well-balanced body is healthy and is able to fight off diseases like cancer better. Simply, it a process which occurs when normal cells are damaged and turn into cancerous cells. Ganoderma extract contains different polysaccharides such as lentinan which are all anti-cancer. These polysaccharides are able to wake up the army of soldiers that are naturally present in your immune system to stop cancerous cells from rebelling against you. Not only that, they can induce cancerous cells to die. They can also protect you from viruses that cause cancer and cancer-causing chemicals such as asbestos. 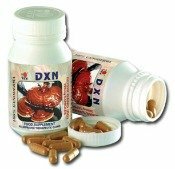 Reishi or Lingzhi mushroom has other therapeutic effects besides cancer prevention. If you're interested in the rest of its health benefits, check out the paper. 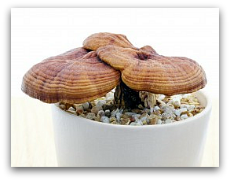 And if you still need more information about its wonders, this page might help you: What is Ganoderma. If you have cancer, your body is equipped to fight it but it needs help. You need a stronger immune system. . .
to help you get through the treatment itself. Red Reishi mushrooms can build up your immune system cells such as the T-cells, natural killers (NK) and macrophages. Treatments like radiation or chemotherapy are harmful to the tumor and unfortunately, to your healthy cells as well. They also produce painful side effects. I saw firsthand how painful they are. Taking Ganoderma extract can either significantly decrease, or totally eliminate painful side effects of both treatments. This is if Ganoderma mushroom extract is taken before, during and after the treatment. According to a report on Anticancer effects of Ganoderma lucidum: a review of scientific evidence by Dr. Yuen J.W., "quality of life of 65% of lung tumor patients showed improvement." Plus...a study done by Cancer Research in the U.K. states extract from "Ganoderma suppresses adhesion and migration of highly invasive breast and prostate cancer cells." Also, I have a personal experience with how Ganoderma extract can help someone with a tumor. In April 2009, my Dad was diagnosed with Stage 3b lung cancer, one of the most aggressive types. He was 83 years old. He underwent radiation but he hated the negative side effects and so after only 3 sessions, he chose not to continue with the treatment. He opted to take Ganoderma extract supplements instead. In December 2009, his doctor was surprised that his tumor stayed the same size when he was first diagnosed. But because of his age and the advanced stage his cancer was in when it was diagnosed, he succumbed to the disease in November 2010. For thousands of years, the phenomenal healing and cancer prevention potential of red Reishi mushrooms benefit people in the Far East. It's about time that Ganoderma gets a chance to prove its worth in mainstream medicine. If you want to try 100% natural and organic Ganoderma extract, you can get the supplements here.